I watched a film on Netflix the other day ANON. And it stirred a whole lot of thoughts for me. On privacy, on shopping, on AR, on how we communicate with each other. And for many businesses, I don't think they are. If the last 10 years of digital disruption and transformation have taught us anything, it's that we need to be agile. We need to move with the times or be swamped by them. But I still see too many people with their head in the sand. It's that thing in a business that someone needs to do. Where you need to invest either time or money or both. So why does business hate it so much? Email marketing, don't read them. I say, are you even in business. Why in 2018 am I still hearing these comments from business? Because for many of them don't understand, or don't know where to start with content marketing, social media marketing or search marketing OR believe that they are irrelevant for their market. They aren't living in 2018, they are living in 1998. They are still thinking how we buy, review, understand, research and communicate is how we did it back in 1998. But the world has moved on. We are in the era of the ATO winding up businesses at a rapid rate, in the era of people shutting offices or business moving offshore. Of large retailers closing doors or closing down. We aren't all going to be on the bleeding edge or be early adopters, but change has arrived. A significant change in how consumers become aware of you, research from you and buy from you and more change is on the way. AR will be the next big leap in consumer shopping and it's coming earlier than you think. Customer led marketing supported by AI is coming. An explosion of Messenger based marketing. Look at the Asian markets and consumers and see how they currently use their phones and their various messenger apps to consume content. It makes what we are using in the west seem ancient in comparison. So how do I address these concerns? How should you address these questions? Firstly, accept that things have changed. We are more demanding, have greater choice and are better informed about our buyer choices. The ease of access to information is huge and with the massive footprint of social media, we can quickly get our hands on quality recommendations from our friends. Secondly understand your customer better. What do they really want, and how do they really want it. Go old school and talk to people and then leverage new school tactics to reach more of those people by reflecting back that you actually know them. When you know this then ponder this thought. Do I really want to be there? Am I best placed to be of service to that market? Now choose where you are going to engage your market. What channels and tools will you use? You do not need to use all of them. Spend time focussing on one social media platform at a time. Learn what works for you and your business and what doesn't. Yes, I did repeat that last point, because this twice as important as all other points. Once you start to see some wins with social media spread your attention to more serious lead generation. If you want people to come to know you better as a business, then tell them more about what you do and why you do it. We want to know, so tell me. Writing is not always everyone's strong point and this is where being a smarter digital marketer comes into play. Outsource this to a copywriter. Copywriters are worth their weight in gold when you give them the raw material to work with. I am working with a client at the moment and we are interviewing them for travel stories for their blog. The raw material is GOLD, we are just pulling it together for them, playing to their strengths as storytellers and our strengths as content writers. A match made in heaven. Focus on building up a bank of really great content and then start scheduling it on autopilot to a social media channel that you know your people are active on. Not sure where your people are? Ask them. Your audience today is not necessarily your audience tomorrow or your audience next week. So reuse your content over and over. New people read mine all the time because I create it and then drop it into a queue to be recycled into the future. Use something like Recurpost or Smarterqueue or Sendible (which I use and love) to schedule out this content in bulk. Share these blogs via your email list. Don't have much of a list? It doesn’t matter, start by sending emails to whoever is in yours. Small is the new big. Get into a pattern of sending a regular email. Weekly, Fortnightly. Whatever fits with you and your customers. But don't overdo it. Schedule when you want to send them and send them each time. Don't assume they know what you do. They don't. Don't assume they know what you know. They don't. Before you get all hung up on website traffic, and the latest SEO snippet you have heard, focus some attention on a free tool that Google provides to everyone. The Google Search Console is a great FREE tool and this is a critical place to start for any business as this lets you see how Google sees your site and what it can’t ‘see’ as well as insights into what people are searching on to find you. Dive into this data or get someone to dive into this data for you. You might be surprised by the difference between what you think people search on and then find you vs what is actually happening. This is a free tool that Google provides to any business. It allows you to check your indexing status as well as website visibility. It is where you submit your sitemap to google so that they know you exist. All websites should have this in place. Check with your developer now if you have yours in place. Then make sure that Google Analytics and Google Search Console are linked together. This is how you make your data work best for you. These are just settings but once you get them in place, your data can start to make more sense to you. You can start to see where you need to put your efforts. These are not hard things to wrangle, but you need to actually make an effort to know about them. Enough with being an Ostrich. 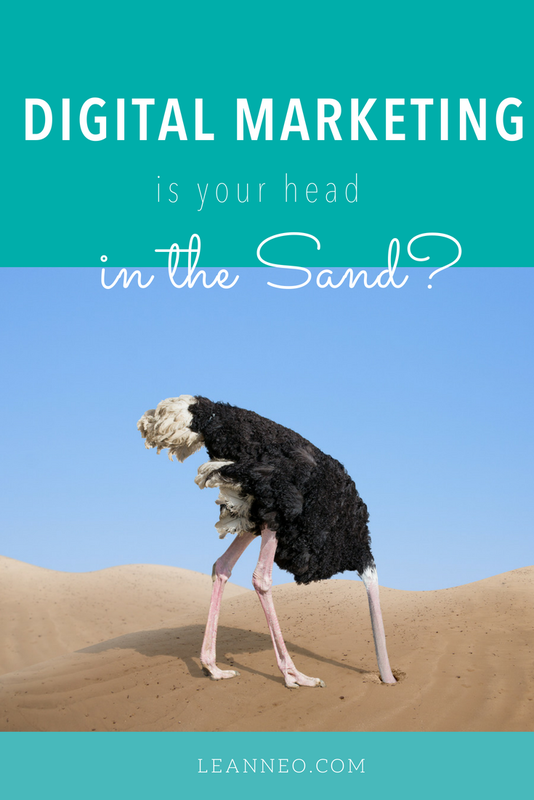 Your business needs you to be a smarter digital marketer.